Swift Parrot survey season is upon us again, with a monitoring weekend coming up on 19 and 20 May. BirdLife Australia’s Swift Parrot monitoring program is essential for assessing where our beloved swifties are, what resources they are feeding upon, and their numbers. Our regional coordinator for swift parrot surveys is Beth Mellick from Wettenhall Environment Trust. If you would like to be involved in this Autumn’s swift parrot count, contact Beth via email to be assigned a site (email: beth@wettenhall.org.au). And regular watchers – don’t forget to let Beth know where you are surveying so we can make sure we cover our whole region! We are again seeking volunteers to search for both species across Victoria, NSW, ACT and Queensland, as Swift Parrots make their way up to the mainland from Tasmania and Regent Honeyeaters move about the landscape in search of flowering Eucalypt trees to feed on. The May 2018 Swift Parrot and Regent Honeyeater survey weekend is coming up soon on May 19th and 20th. As always, we are happy for people to undertake their searches up to a week on either side of the survey weekend. Opportunistic sightings from any time of the year are also welcomed. 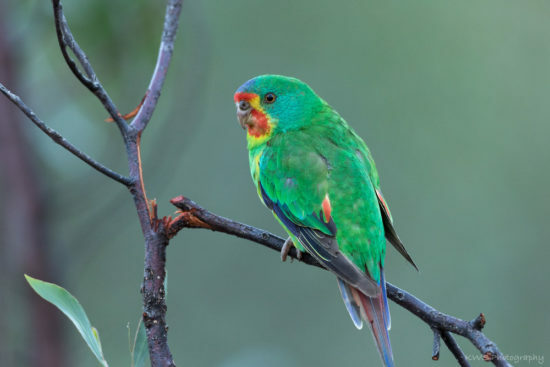 So far this season there have been scattered Swift Parrot sightings from across its mainland range – with the highest clusters around the north-eastern fringes of metropolitan Melbourne and returning birds to favourite haunts such as Mt Majura (ACT) and the Cessnock forests of the Lower Hunter (NSW). There are Spotted Gums noted flowering on the South Coast of NSW (e.g., Marramarra National Park), Coastal Grey Box is flowering in the Lower Hunter and Swamp Mahogany is starting to flower in coastal areas – each of which are attracting large number of lorikeets and other nectar-feeders. If you are new to the plight of this Critically Endangered parrot, the BirdLife website has a profile on swift parrots here.